When logging an Action on a ticket, you can insert a KB article on the fly. This is an easy way to provide answers to repetitive questions and avoid the need to retype the solution over and over again. Some people call this “canned responses”. Suggested Solutions: TeamSupport will suggest relevant articles to you. The suggestions are based on keyword tags in your KB article. These tags will match keywords that you have used in your ticket. Search for Solutions: You may search through public or private KB articles by typing in a KB number, keyword, or phrase. Matching results will be displayed in the drop down menu. You may click/select any article to preview it on the right hand side of the Suggest Solutions window. Insert Link: Inserting a link will allow the customer to access the KB article from your Customer Hub. Please note that when using this feature, if you do not allow anonymous access to your KB articles, your customer will be asked to log in before they can view the article. The “Allow Anonymous Knowlege Base” setting can be found under Admin->Customer Hub->Basic Hub Settings->Anonymous Access Settings. Insert Article: This method will simply copy all text, images, and recordings that are present in the preview pane into your ticket action. Only public actions in the KB article will be copied to the ticket. Private actions in the KB article will not be previewed or copied to the ticket. 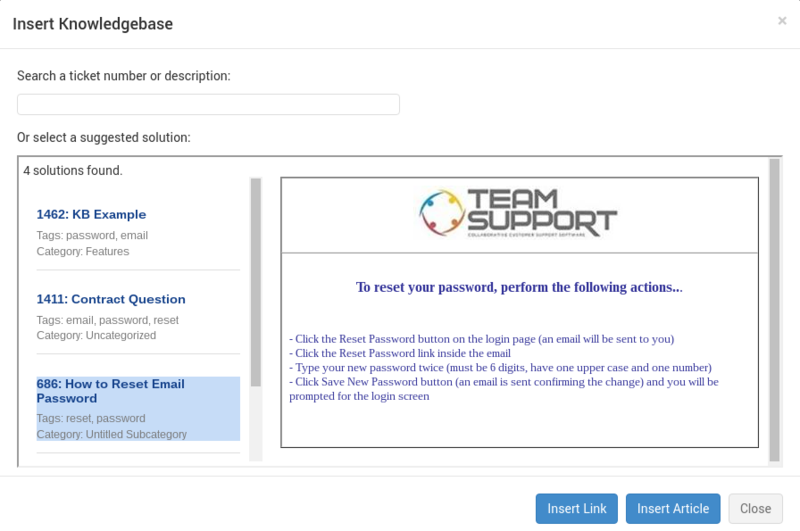 The entire description of the text is editable, even the portion that came from the inserted Knowledge Base. Make a new ticket with any Ticket Type. The ticket name is the KB name and the description is the article body. Attach any files, insert a screen recording, and/or images. Set the Status of the ticket to Closed. Check the box Knowledge Base. Optionally, choose a Knowledge Base category. Log a new action in the ticket and type in any leading text. Click the Suggested Solutions button. Preview one of the suggested solutions that have tags that match the keywords you have used in your ticket. Click the Insert Article Button.